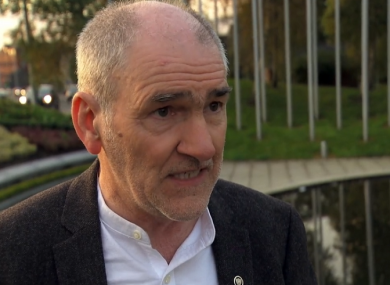 Mickey Harte reflects on his memories of trying to enjoy Gaelic Football during the Troubles in the latest episode of Laochra Gael. TYRONE MANAGER MICKEY Harte recalls his memories of trying to enjoy Gaelic Football during the Troubles in his upcoming Laochra Gael episode. Harte reflects on the difficulties that GAA fans in the North faced during that turbulent period in the episode, and explains how it affected their ability to fully commit themselves to the sport. “When you’re living through a conflict of that nature,” he says, “you don’t have your full mindset to be able to afford to devote your life to an activity which is a hobby because there’s too many other things to think about. “There’s family to think about, there’s the danger element in it, there’s just not knowing what’s going to happen next. “From Down in 1968 until Down again in 1991 no Ulster team won the All-Ireland. It’s more than a coincidence that there was no great success during that period of time which very much coincided with the troubles at their worst. “I don’t think that people in the deep south — we’ll call it that — fully appreciated, and didn’t fully understand what exactly people in the GAA background had to sort of endure if you like in many ways, to keep the games alive up here. Harte later touches on the Omagh bombings which took place in 1998, and the relief he felt when he came home to find his family were all safe from the atrocities. “My wife could have easily been in Omagh with a couple of the children preparing for going back to school to get uniforms and stuff like that. I didn’t know if she had gone or not, it was often that she would go. The programme, which will be aired tonight on TG4 at 9.30pm, features other aspects of Harte’s life, including the All-Ireland titles he achieved with Tyrone. He also talks about the personal tragedies he experienced following the deaths of Tyrone players Paul McGirr and Cormac McAnallen, as well as the loss of his daughter Michaela, who was killed. Email “'People were killed over their connection with the GAA and that was the most tragic thing of all'”. Feedback on “'People were killed over their connection with the GAA and that was the most tragic thing of all'”.